History: (What If? 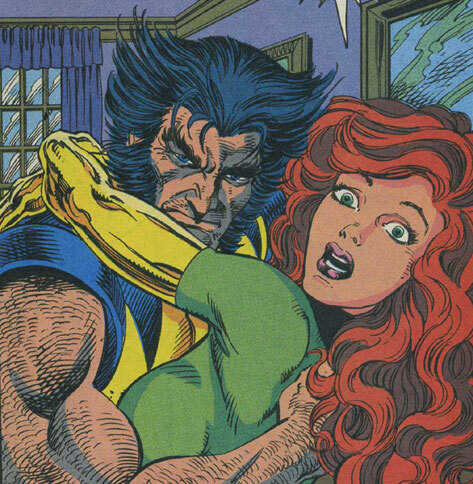 II#60/3) - After the Phoenix Force had taken the form of Jean Grey, it shared an intimate moment with Wolverine. While they were in each other's arms, Cyclops walked in on them. Phoenix apologized to Scott but explained that she just could not be held back anymore. As time passed, Phoenix grew rougher and more out of control in battle, savagely lashing out again the White Queen of the Hellfire Club when Mastermind's illusions were revealed. Unfortunately, Mastermind's illusions still affected Phoenix and she attacked Cyclops when he tried to save her from Mastermind. She eventually took her vengeance on Mastermind and rejoined the X-Men as they escaped the Hellfire Club mansion. 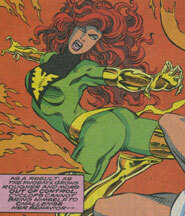 Due to Mastermind's psychic tampering and her own out of control emotions, Phoenix soon became Dark Phoenix and attacked the X-Men, despite Wolverine trying to help her. Professor Xavier managed to calm the Phoenix but soon after, the X-Men were teleported to the Shi'ar Empire where Lilandra announced that Phoenix must be destroyed for the sake of the universe. Professor X challenged her to a duel of honor between his X-Men and her Imperial Guard, a battle that stressed Phoenix back into her Dark Phoenix persona. Wolverine tried to help her once again but his influence did not help matters and Dark Phoenix lashed out, destroying the X-Men, the Imperial Guard, the Shi'ar court. She then flew out into space and lashed outward, destroying the entire universe. Colossus was the same as his Earth-616 counterpart up until he was killed along with the rest of the universe by Dark Phoenix. He could transform into living steel with superhuman strength and durability, like his Earth-616 counterpart. 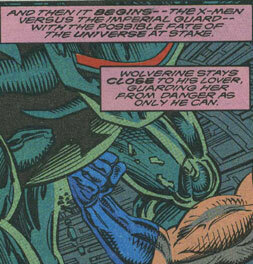 Cyclops was essentially the same as his Earth-616 counterpart until he walked in on Wolverine and Phoenix. Saddened, Cyclops sank into a depression. Despite this, he still tried to save Phoenix from Mastermind, only to get blasted to the ground by the manipulated Phoenix. He then led the X-Men in escaping from the Hellfire Club mansion and soon watched in horror as Phoenix became Dark Phoenix. Following her temporary defeat, he was teleported along with the other X-Men to the Shi'ar Empire where he battled the Imperial Guard for Phoenix's life until she became Dark Phoenix once again and destroyed the entire universe, Cyclops included. He had the same optic energy beams that his 616 counterpart had. Lilandra was the same as her Earth-616 counterpart up until Dark Phoenix destroyed the universe, taking Lilandra with it. 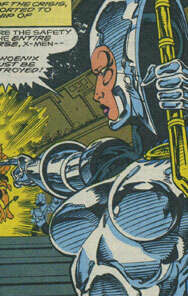 Lilandra presumably had telepathy, like her 616 counterpart. Manta was the same as her Earth-616 counterpart up until Dark Phoenix destroyed the universe, killing Manta with it. 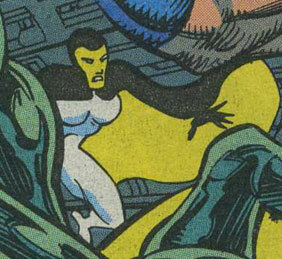 Manta presumably could produce intense light from her body, like her 616 counterpart. Mastermind was the same as his Earth-616 counterpart up excepting that when he met Phoenix, she was seeing Wolverine instead of Cyclops. He was killed when Dark Phoenix destroyed the entire universe. Mastermind had the mutant power to generate illusions, like his 616 counterpart. Nightcrawler was the same as his Earth-616 counterpart up until Dark Phoenix destroyed the universe, killing the X-Men instantly, Nightcrawler included. 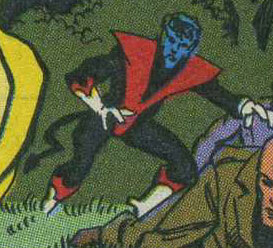 Nightcrawler could presumably teleport, adhere to surfaces, and blend into shadows, like his 616 counterpart. Phoenix was the same as her Earth-616 counterpart up until she began seeing Wolverine behind Cyclops' back. The longer she dated Wolverine, Phoenix became more and more out of control, savagely attacking both Mastermind and the White Queen of the Hellfire Club after they tried to manipulate her. When she became Dark Phoenix, she was teleported to the Shi'ar Empire with the X-Men where Lilandra announced that she must die to save the universe. Holding it together long enough to battle the Imperial Guard, she eventually became Dark Phoenix again under the stress and flew out into space, destroying the universe and everything in it, presumably including herself. Phoenix had telepathy and telekinesis on a cosmic scale, like her 616 counterpart. Professor X was the same as his Earth-616 counterpart up until Dark Phoenix destroyed the universe, killing him along with it. Professor X had the same telepathy that his 616 counterpart had. Warstar was the same as their Earth-616 counterparts up until Dark Phoenix destroyed the universe, killing them with it. Warstar consisted of two sentients, B'nee & C'cil, one of which had superhuman strength and the other able to generate an electric charge, like their Earth-616 counterparts. White Queen was the same as her Earth-616 counterpart up until she helped manipulate the Phoenix. 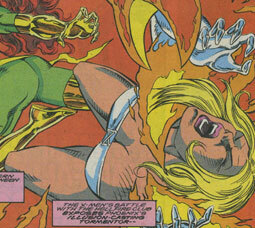 Phoenix savagely attacked White Queen in retaliation and eventually destroyed her, along with the rest of the universe. White Queen had telepathy, like her Earth-616 counterpart. 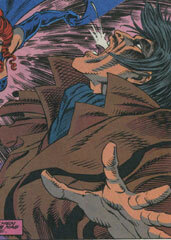 Wolverine was the same as his Earth-616 counterpart up until he began seeing the Phoenix. As they dated, Phoenix became more and more out of control and when she became the Dark Phoenix, Wolverine tried to talk sense into her. Eventually, the two were teleported to the Shi'ar Empire where they battled their Imperial Guard until Phoenix began to become Dark Phoenix again. Wolverine once again tried to talk her back to normalcy but she rebelled and flew out into space, destroying the universe and Wolverine along with it. 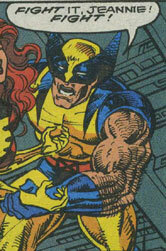 Wolverine had adamantium claws, superhuman senses, and a healing factor, like his Earth-616 counterpart. The X-Men were the same as their Earth-616 counterparts, aside from Wolverine was dating Phoenix instead of Cyclops. They helped free Phoenix from the control of the Hellfire Club and soon after, battled Phoenix herself as the Dark Phoenix. Following the Dark Phoenix battle, they were teleported to the Shi'ar Empire where they battled the Imperial Guard until Dark Phoenix destroyed the universe, including the entire X-Men team. 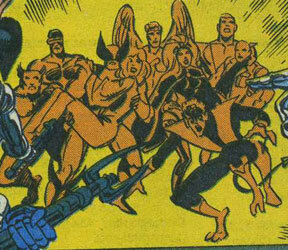 They were (from left to right): Beast, Cyclops, Wolverine, Phoenix, Angel, Storm, Nightcrawler, Colossus, and Professor X.